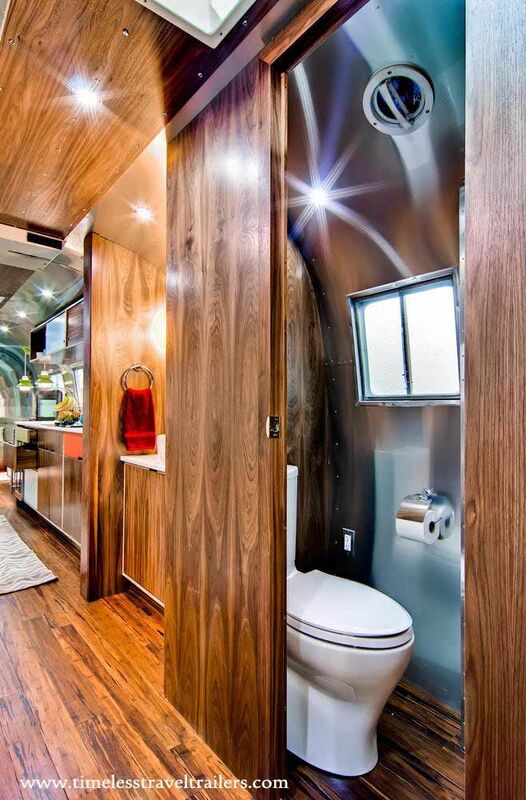 Timeless Travel Trailers is a custom vehicle manufacturer, best known for restoring Airstreams, Spartans, and Westcrafts into luxury homes and food service trailers. 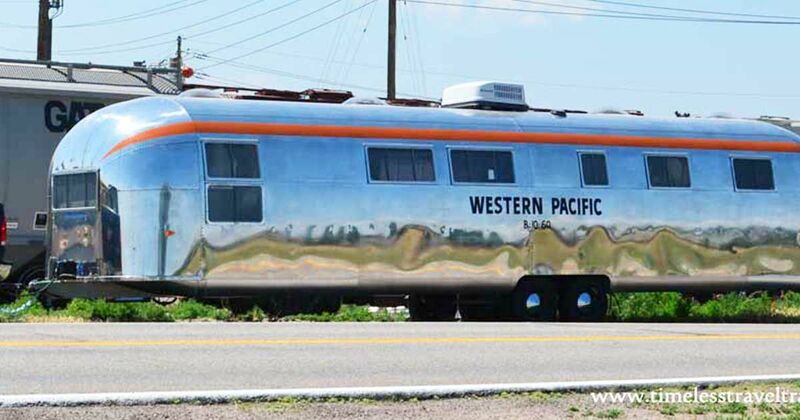 The 1962 Western Pacific Airstream below is one of ten commissioned by the Western Pacific Railroad company. These 40-foot trailers were used as private train cars by the foremen maintaining the railroad. The trailers were created by riveting two 20-foot trailers, making the 1962 Western Pacific Airstream symmetrical from end to end. The "double" trailer was then mounted on a 50’ railroad car. In 1989, Union Pacific Railroad acquired Western Pacific, and the Airstreams were dismounted from their flatcars. One of the ten units went to Portola, CA at the Western Pacific Railroad Museum. Another went to old Sacramento, California, to the California State Railroad Museum. Believed to be one of only five left in public possession, Timeless Travel Trailers had the honor of restoring this 40-foot 1962 Airstream. 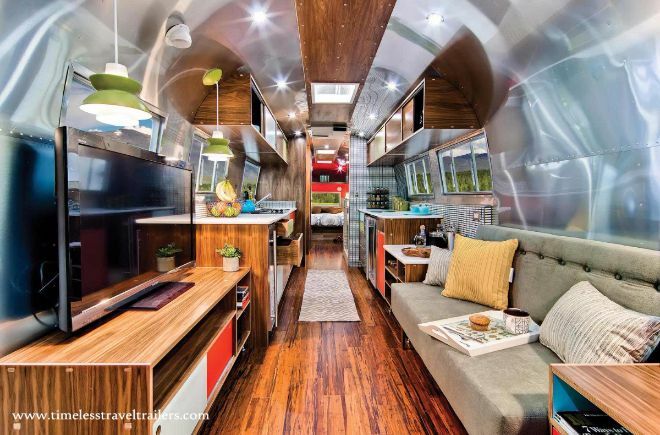 The 40-foot-long RV is quite the sight to behold from the exterior. 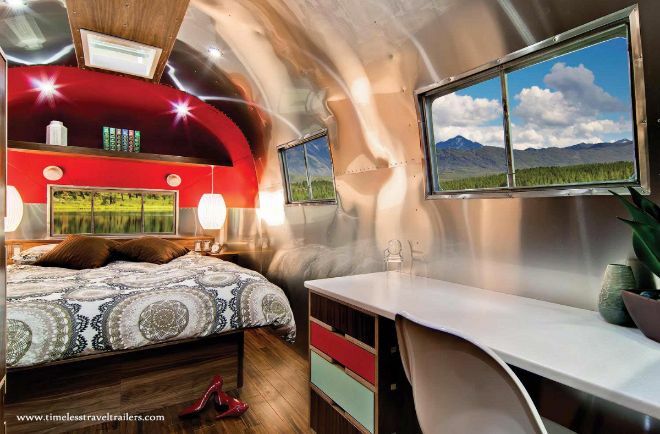 The Airstream's exterior has been polished to perfection and features Western Pacific branding. The trailers were not meant for road use but were set on rail cars to be used as private train cars in their heydays. 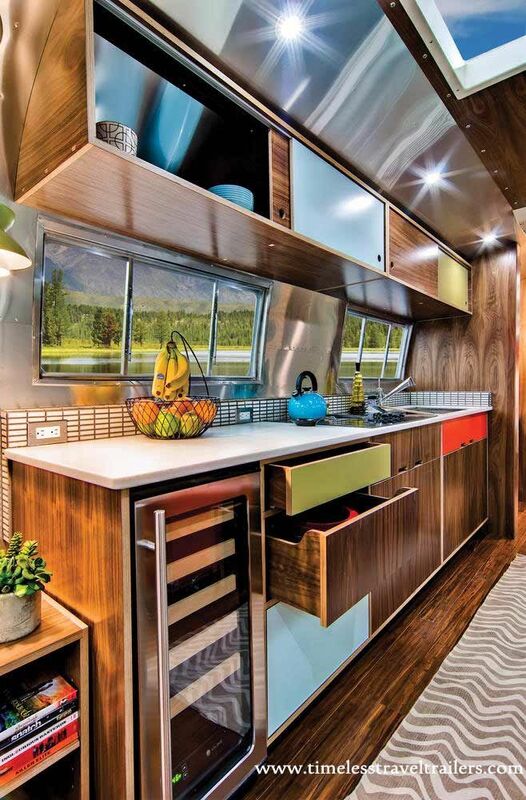 The interior design of the Airstream pays homage to the 50s but incorporates the modern technology of the 21st century including air conditioning and television. The built-in sofa in the main seating area is covered in a gray color with white and yellow striped pillows for accents. 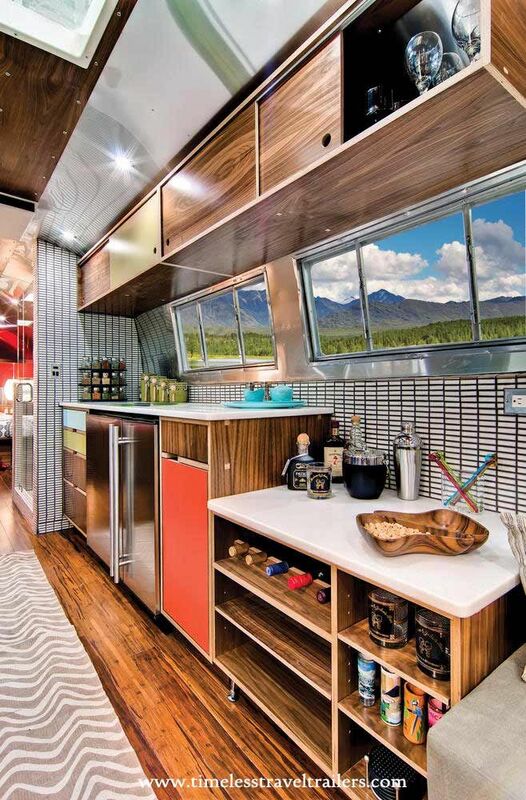 The galley of the Airstream is completely open and features all the modern comforts of home. The cabinets are a mixture of laminate drawers and walnut veneer with built-in drawers to ensure you won't run out of storage space. The trailer has been completely customized with over-the-top modern design. The windows remain uncovered to provide light while the polished silver walls provide reflection to create a cool, ultra-modern-looking space. The refrigerator is operated by a touch pad, and the galley sink includes a wood cutting board and wet surface work area. The vanity features a round ceramic sink with chrome faucet that sits on a white countertop. It shares a wall with the galley. The lights have metal band details and provide ambient light that can be dimmed. The toilet is a dual flush while the unique shower is covered in small tile with a bronze accent stripe and partial glass corner wall. 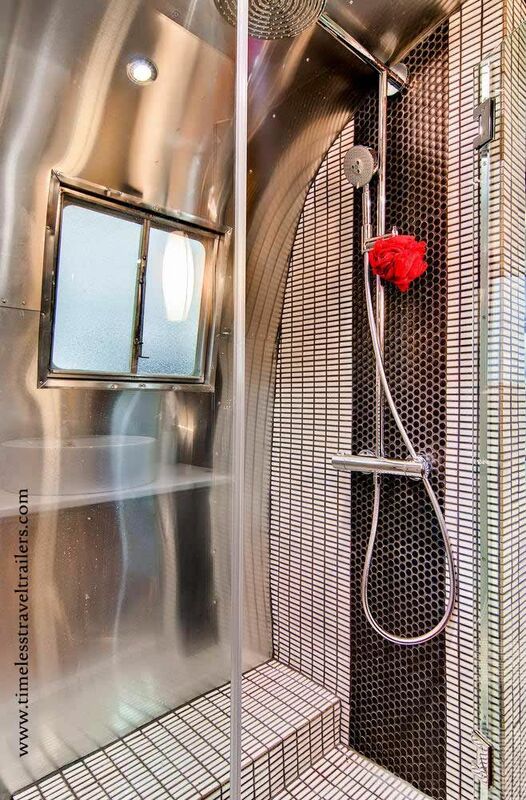 A stainless steel hose with a flexible shower head and glass door finishes off the shower area. 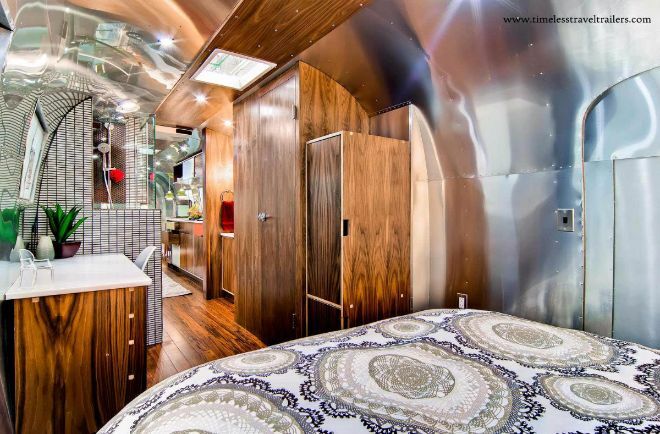 The bedroom is open to the living area and is located at the end of the Airstream. There is plenty of storage space under the bed which can be accessed by lifting a hinged platform. The bubble lamps hanging on both sides of the bed were iconic in the 50s . 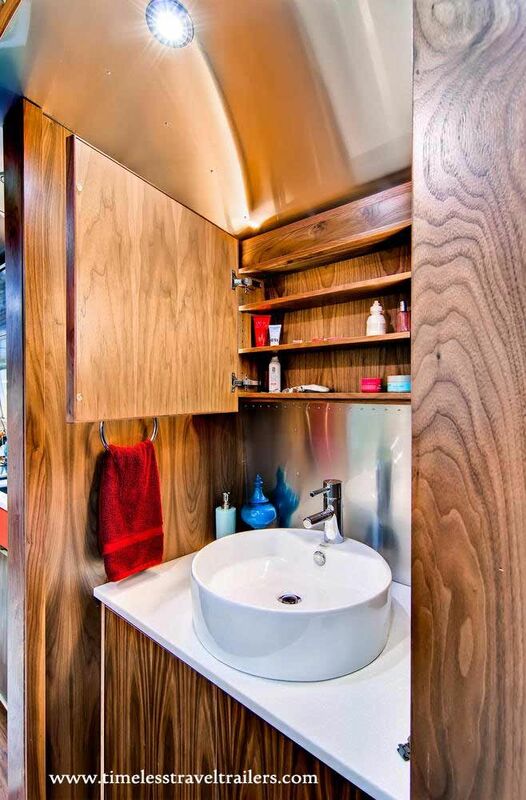 Timeless Travel Trailers truly outdid themselves restoring this piece of history. It was recently auctioned off for $210,000 at The Mecum Denver Auction. What's your take on this remodel? Please let us know in the comments and SHARE this article with your friends on Facebook.